GPS capabilities help coordinate your workforce out in the field and at a job site. 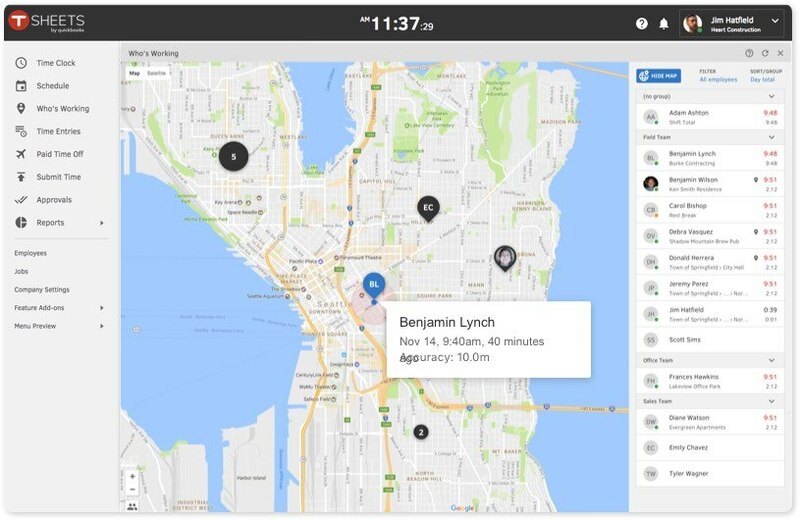 TSheets adds worker locations to the map when employees clock in. Maps update throughout the day. Employee location data allows managers to strategize remotely, using the “Who’s Working” window. Data is saved and attached to employee time cards, so you can access it at any time. Save time creating employee schedules with real-time info about who’s clocked in and where. TSheets GPS tracking allows you to coordinate your teams from anywhere. GPS won’t drain your phone’s battery. TSheets uses an average 5MB of data per month. Rely on TSheets for greater accountability and higher performance. You’ll love how easy it is to track time with TSheets. The GPS feature allows us to see where the employee is at the time of clocking in, helping to ensure accuracy and honesty. Now that TSheets offers a scheduling (dispatching) feature to the program, it truly is the perfect app for a business like ours, which has many employees going out to many jobs in a day! If your payroll requires extensive job costing, then this is the app you MUST have! Saves so much time and eliminates killing trees with stacks of daily timesheets. Creates a way to track field technicians with greater accuracy and GPS timestamps. Cannot say enough about this APP—highly recommend. It has already paid for itself in the first two weeks of the pay period, with catching time that would not have been billed and catching employees clocking in/out incorrectly. The GPS feature is an absolute must for my field.